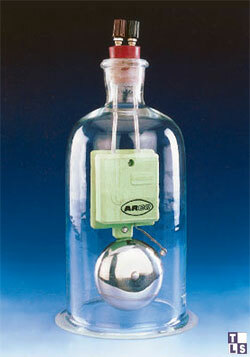 Consists of a bell jar with a household bell or buzzer suspended inside. A vacuum is created within the jar whilst the bell is ringing. Once a near vacuum has been created, the bell cannot be heard as sound cannot travel through a vacuum. The bell is connected to a lab pack or batteries and rung to show pupils it can be heard under normal circumstances. The bell jar is then connected to a vacuum pump using a vacuum plate (see Fig 2) and the air is removed from inside creating a near vacuum. The bell is then again rung. This time however, it cannot be heard. Small low voltage buzzers can be used as a bell replacement for the bell and work in exactly the same way though teachers generally prefer bells as students may be able to see the hammer moving, proving that it is actually ringing even though they cannot hear it. Some vacuum pumps are better than others at keeping a strong vacuum though if you cannot completely lose the sound, you will at least notice the volume decreasing. Sound is simply a series of longitudinal waves travelling from the source, through the air to our ears. Without air present, these waves cannot form and therefore sound cannot be conveyed. In a longitudinal wave the particles oscillate back and forth in the direction of the wave movement unlike transverse waves which like waves on the sea, single particles travel up and down and not in the direction of the wave. Because you will not be able to create a perfect vacuum, you may still be able to hear the bell ring slightly. Vibrations from the ringing bell can also travel up to the bung in the bell jar which in turn may resonate the jar slightly. This means you may hear the bell ring, however strong the vacuum. To compensate for this, try to insulate the bell as much as possible from the bell jar. Hanging the bell using elastic cord means some of the vibrations will be absorbed by the cord and not be transferred to the bell jar. 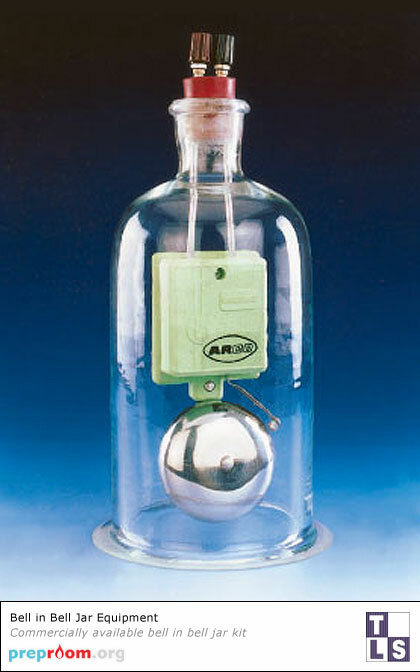 Only bell jars specifically designed to withstand the pressures of a vacuum should be used. These can be bought from lab suppliers.